Prototype: 7 different design German Federal Railroad (DB) and Saarland Railways (EdS) high-side gondolas. Among them, 1 Association Design type Om (Om Breslau) gondola, with a brakeman's cab. 1 type Ommu (Duisburg) gondola, without a brakeman's cab or brakeman's platform. 1 Interchange Design type Om 21 (Om Königsberg) gondola, with a brakeman's cab. 1 type Om 12 (Om Breslau) gondola, without a brakeman's cab or brakeman's platform. 1 type Om 12 (Om Breslau) gondola, without a brakeman's cab but with a brakeman's platform. 1 Interchange Design type Om (Om Königsberg) gondola, without a brakeman's cab or brakeman's platform. 1 type Omm 37 (Duisburg) gondola, without a brakeman's cab or brakeman's platform. The cars look as they did around 1952. Model: All of the cars have different car numbers. All of the cars have a load insert of real scale-sized coal. The cars have authentic weathering. Total length over the buffers 79.8 cm / 31-7/16". 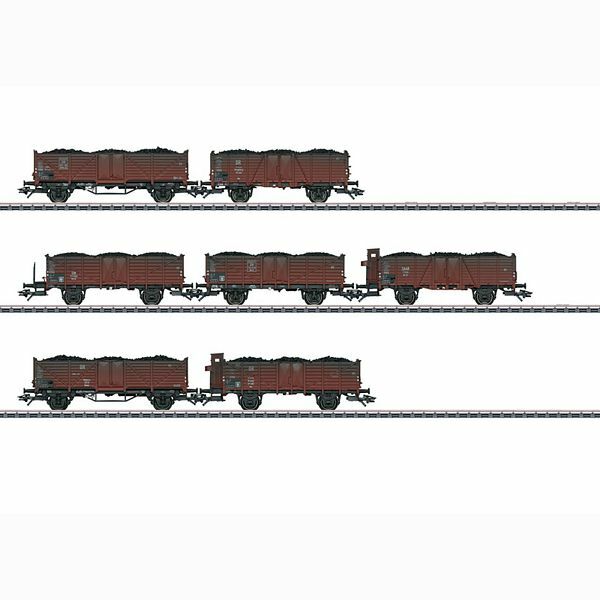 DC wheel set per freight car E700580.